I have recommended Quora Ads to every client I’ve worked with since the channel was in beta. Some of those clients gave immediate pushback thinking another channel wasn’t worth the time. Most of those clients felt their audience wouldn’t even be on the channel at all. But most of the time, my clients found their audience and success advertising on Quora. Let me show you how you can easily find your audience on Quora in just three steps – no matter what industry you are in. If you feel the same way on either of those pushbacks, I’m going to prove you wrong. Quora already has more users than Pinterest. It is a channel PPC marketers would be foolish to continue to ignore. And I say this based on my own experience. The first client I got on Quora Ads over a year ago had a $25 CPA on Google. On Quora, we were getting a $1 CPA. Yes, you are not going to get the same volume as the big search engines. But if you’re looking to hit a highly relevant group of people who are actively researching questions about products or services you sell, you need to be using Quora Ads. The first step for every marketer interested in Quora Ads is signing up for a business account. After your account is created, you will get your Quora pixel to add to every page of your site. 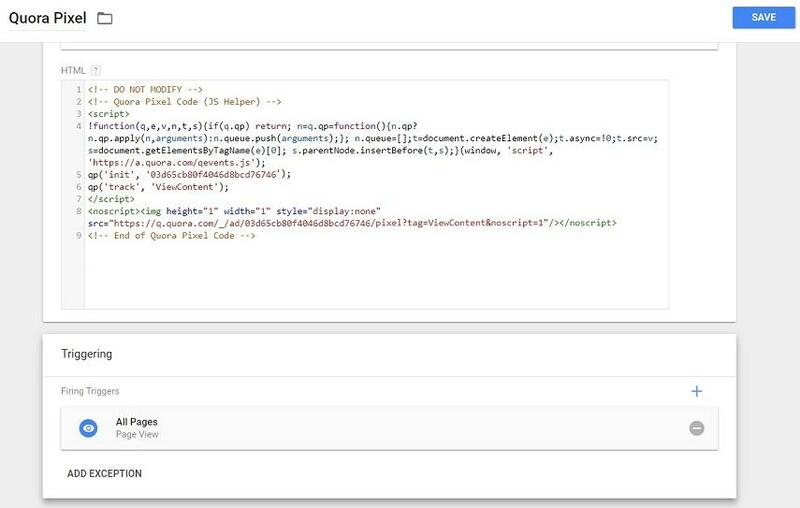 I have found the easiest way to implement the Quora pixel is with Google Tag Manager. Once the pixel is installed on your site or landing pages, you’ll be able to create remarketing audiences just like the one we see below. Once your audience is created, give it some time to populate. You may find out pretty quick how many of your current users are already on Quora. Yup, that’s 110,000 estimated unique users. Tell me again about how your users are probably not on Quora? Okay, that was mean, but it was really easy for me to disprove their assumption. Want to know the best part about this step? You don’t even need to enter your credit card information to get this data. That’s right. You can sign up for Quora Ads, get the pixel, and create audiences without having to pay a penny on ads. No more excuses! 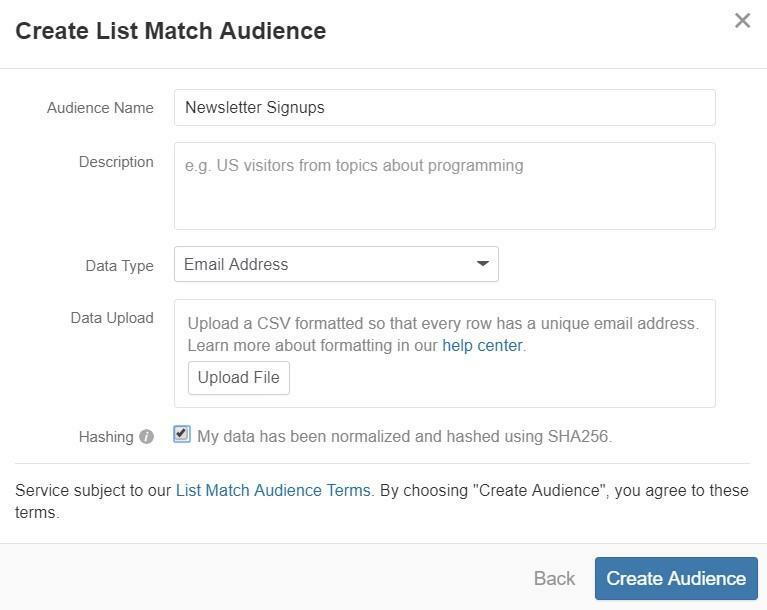 On the same Audiences page where we created our website traffic audiences, Quora advertisers also have the option to upload their email lists to use as audience targets. The beauty of list match for Quora Ads is that you need a list of only 200 users for your campaigns. It is important to note that the vast majority of users on Quora sign up using their personal email. If your email lists consist of company emails, this may not be the best option for you to test. But no matter what, give it a try and see if you can start advertising to a very specific group of your current customers, or better yet, a nice list of leads in your pipeline. One of the easiest ways to find out if your audience is on Quora is to just search for the topics yourself. Yes, I am serious. I’ve worked with all sorts of clients in many industries, and I can easily find topics or questions to satisfy every single client I have ever had. Does your business book trips for people to go to South America? Search for it. Your audience is on Quora. Work in CNC machining? Search for it. It’s there. Want to help people looking for help with real estate law? Your audience is definitely on Quora. Sell a variety of lawn mowers? Yeah, you probably guessed it. It’s on Quora too. I’m just showing you topics right now. Even if your industry’s topics do not have a ton of followers, see if there are questions with a lot of activity. You can target the individual questions instead of the topic. The volume may not be there, but you may also be the only company putting ads on those low-volume questions. I always recommend that my clients try out Quora Ads, and I am very confident you will be able to use this platform to engage with your target audience, as well. So give my suggestions a try. Sign up for Quora Ads and use these three easy steps to find your audience on Quora.